I wrote several Guest Blogs before getting my own space. This is one about Innoventions at Epcot! This building in Disneyland formerly housed Carousel of Progress. Personally, I wish it were still there. Inside Innoventions you’ll find video games, trivia contests, a glance into electronics that are coming our way and opening any day now, Dream Home. I haven’t seen it but the images I have seen of the previous Home of … Continue reading "Night Scenes – The Future’s so Bright"
Recently, I met up with neighbors and friends for dinner at the Yachtsman Steakhouse in the Yacht Club Resort. Bob and Rita Ondercik are long-time Disney fans and have been DVC members since the beginning of DVC (when awesome benefits were added for joining). Bob and Rita also volunteer at Give Kids The World, a … Continue reading "WDW with Neighbors"
I thought I’d post some follow-ups to a couple of previous blog entries. Last week I wrote about the new House of the Future, coming to Disneyland in May. (That blog entry can be found HERE.) One thing the article didn’t mention is that it was going in on the ground floor of Innoventions. We … Continue reading "Blog Follow-ups"
Welcome TrooperBill as our guest blogger. 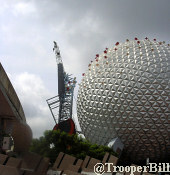 He visited Epcot (8/1/07) and sends these photos and updates: The wand that once adorned Spaceship Earth continues to be dismantled. You can see progress daily. Larger Image Larger Image The House of Tomorrow in Innoventions recently reopened — the entrance way is still the same, with the fingerprint … Continue reading "Epcot Updates"